The Pennsylvania Barge Club was founded in 1861. Then it was little more than a storage shed for securing the rowing shells owned by the members. 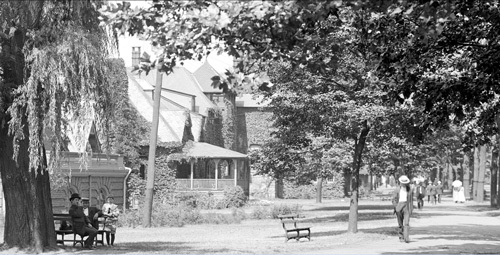 As membership grew rapidly, the Club subsequently engaged Philadelphia architect Louis Hickman to design an enlarged two-story Victorian-style stone building containing additional private and public spaces. This was completed in 1869. The building was clad in Wissahickon Schist, a very popular 19th century building stone quarried in Valley Green. Its most notable and distinguishing features are the first floor “Witches Hat” enclosing the circular stairway to the boat bays, and the large and inviting front porch overlooking the bike path in Fairmount Park. In 1912 extensive modifications were made to the second floor, adding function spaces, a Pub, and kitchen. A third floor with locker rooms was also added. The entire building was extensively renovated beginning in 2009, and modern electric, heating, cooling and plumbing facilities were installed. PBC remained highly successful in competition, winning many National Championship events, and six Olympic medals in the Games of 1920, 1924, 1928 and 1932. Many artifacts, medals, photos, banners and memorabilia celebrating these victories are on display throughout the Club. Tragically, the Club lost many members during World War II and the Korean War, and became unsustainable as a rowing operation in 1955. The Club resigned from the Schuylkill Navy and transferred all of its assets, including the building, to a new non-profit organization called the Schuylkill Navy Association. This entity maintained the building and leased portions of it to various administrative rowing organizations, including the Schuylkill Navy and the National Association of Amateur Oarsmen. In 1958 the boat bays were leased to Drexel University for their rowing program, which remained at PBC until 2008. Over the years, several other organizations leased facilities at the Club, including the US Rowing Association (successor of NAAO), the Masters Rowing Association, the Schoolboy Rowing Association, the Middle States Regatta Association, the Dad Vail Regatta and the Pennsylvania Rowing Program for the Disabled. The Schuylkill Navy Association was later reorganized as the US Rowing Society and then again as the Philadelphia Rowing Society, which in 2008 revived The Pennsylvania Barge Club as an operational rowing entity, and rejoined the Schuylkill Navy. He was also one of the founding fathers of American women’s rowing and was a vocal advocate for the establishment of competitive women’s programs everywhere. He taught his wife, the legendary Ernestine Bayer, to scull while holding on to her gig at the PBC docks. This at a time when women in a boat on the Schuylkill were mocked and ridiculed by many. Ernestine was an early star in American women’s rowing, and was later inducted into the USRA Hall of Fame. Their daughter, also named Ernestine, was one of the first of the great generation of international women rowing athletes in the ’60’s. Our Club’s annual service award is dedicated to preserving the memory and legacy of Ernest Henry Bayer. Today, PBC members enjoy top-notch rowing shells and equipment, as well as beautifully appointed public and private spaces, including the Board Room, Trophy Room, Main Reception Room, Bathrooms, Kitchen and a brand new Pub. There are new Men’s and Women’s Locker Rooms on the completely renovated third floor. The Club has two large-screen TV’s on the second floor, and Wi-Fi throughout. Club members compete at all the Philadelphia regattas, as well as The Head of the Charles, USRA Masters Nationals and FISA World Masters. PBC also sponsors the annual Philadelphia Frostbite Regatta, which is held on the last regatta weekend of November, and features events for junior, collegiate and master men and women. Pennsylvania Barge Club is an amateur rowing club, situated along the historic Boathouse Row of Philadelphia, Pennsylvania. It was founded in 1861 and joined the Schuylkill Navy in 1865. The Club’s boathouse, at #4 Boathouse Row, is also known as the Hollenback House, named for William M. Hollenback, Jr., who served as President of USRowing from 1979 until 1985. 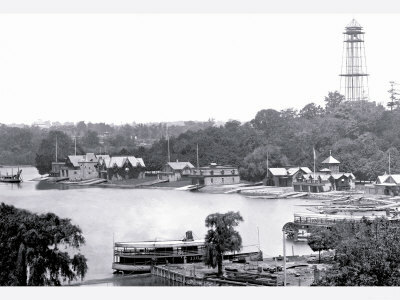 Pennsylvania Barge Club (directly below steel observatory tower) in 1876. Steamboat in foreground took passengers to the Centennial Fairgrounds on the west bank from the Fairmount Waterworks on the east bank of the river. PBC in center of photograph. Note the silt filling in along the riverbank wall, necessitating finger piers for the boathouses. Over the years the silt settling near the dam has had to be removed to keep river flowing. In foreground are motorized workboats. Along Bachelor’s pier is a long sleek coaching launch. Front, streetside, porch of ivy-covered PBC visible in center in this photo from National Archives. People out for Sunday stroll along Boathouse Row. Notice knickers on young boy at left and men wearing boaters hats. In Schuylkill Navy races, Pennsylvania Barge had 359 entries and 106 victories. Its teams represented the United States in the 1920 (four-with-cox), 1924 (four-with), 1928 (four-with and four-without), and 1932 (pair-with) Olympic Games. The 1932 Pennsylvania Barge pair, representing the United States, won the Gold Medal. Charles Kieffer of that pair was a LaSalle College High School graduate. A small group of older members of the Pennsylvania Barge Club made a strong attempt to keep the Club and boats in repair and to build an active rowing Club again, but the Club never really recovered from the loss of its young men to the Armed Services during the war.. Through inactivity and lack of new racing equipment, it became increasingly difficult to interest young men to join the Club, since there was little to offer them. Vandalism and deterioration of the property made it still harder to continue. The Club therefore decided to withdraw from the Schuylkill Navy to avoid running up more indebtedness. It was not the intention at that time to discontinue existence but, as the process it was realized by the few members left that it would be impossible to start activities again because of the cost of boating the men. About this time a number of active rowing men felt it would be an excellent thing for the Navy to have its own building for headquarters and were seeking ways to secure one of the mansions of Fairmount Park. Consideration was then given to the use of the Pennsylvania Barge Club for this purpose, since it possessed a logical location and an ideal arrangement for social functions and meetings, and to serve as headquarters for visiting oarsmen and officials at regatta time. Since 1938, Pennsylvania Barge Club has had 57 entries and 12 victories in Schuylkill Navy Regattas and a grand total of 359 entries and 106 victories. In 1946, Hugh Sharp won the annual cross-country race for Pennsylvania. In 1926-27, the first season of basketball, the Club won the championship of the Schuylkill Navy League. On December 14, 1955, when its letter of resignation from the Schuylkill Navy was accepted, Pennsylvania Barge Club officially disappeared from the rolls of the Navy and ceased all rowing activity. The Club officers, including Ernie Bayer, Earle Baltz, Tom Farrell, Len Scharff, Leon Butler, and other Club members, were active in the negotiations whereby the Club assets were transferred to the Schuylkill Navy Association. This organization was formed for the purpose of owning and operating the Club house, since it was realized that the Schuylkill Navy itself could not practically undertake the financial and other problems involved in ownership of the Club. 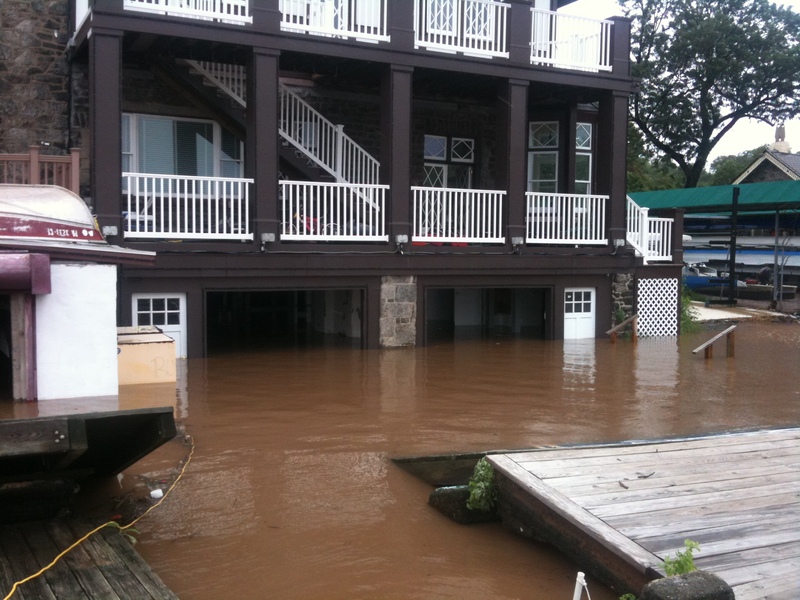 Extensive improvements were immediately necessary to place the Club house in condition for the use of the Schuylkill Navy Association. Officials and members of all the Clubs were were solicited to become members of the new Association, the Dues being $10. per year for Contributing Membership and $100 for Life Membership. A sufficient number of members were secured in the following months to permit the start of the necessary renovations. As more members came in, additional work was done, as the Club house took shape as a truly representative and authentic headquarters for Schuylkill Navy activities. Outstanding facilities of the house are the Board room with its long mahagony table and leather-covered arm-chairs, a large beautiful display case for permanent Schuylkill Navy and NAAO trophies, and a bar and equipment for dinners and other social events. 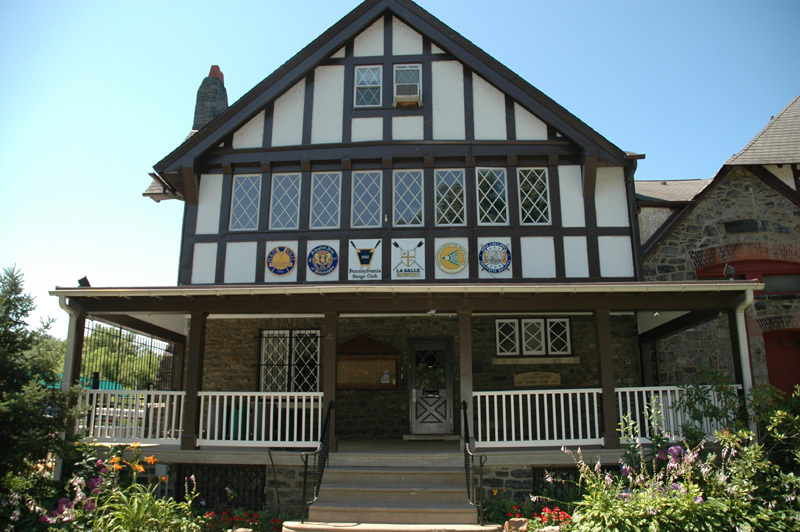 The Schuylkill Navy Association house has officially become the headquarters, not only for the Schuylkill Navy, but for the National Association of Amateur Oarsmen, the Schoolboy Rowing Association, and the Middle States Regatta Association. As a result of World War II, the Club suffered a drastic reduction in membership. Because of its loss of membership, in 1955, the Club turned its boathouse over to a sucession of caretaker organizations and the building served as an administrative center for rowing, including serving as headquarters for the National Association of Amateur Oarsmen (which later became USRowing), as well as, the Schuylkill Navy, the Philadelphia Scholastic Rowing Association, the Middle States Regatta Association, the Center for Adaptive Sports, the Frostbite Regatta, and the Dad Vail Rowing Association. In 2009, the Pennsylvania Barge Club was reestablished as a rowing club.